Many thanks to everyone who took the time to watch, listen, share, and express positive feedback to my sit down interview with Newsy on my family’s experience as former refugees. As many of you may be aware, the refugee community(ies) hold a special place in my heart, and not a day goes by, do I think about their survival, their battles, their resiliency, and how difficult the integration process is once they are in a new land. For many former refugees like my family, the scars & trauma from the violence, the escape, and arrival will never disappear, and in many ways, the psychological effects gets passed down to the children who never had to experience that first-hand trauma. It is also said that it can continue on for up to 6 generations! Refugees are more than just people who have been displaced. They once were a part of their former society. They were doctors, lawyers, grandparents, nurses, farmers, restaurant owners, taxi cab drivers, etc. They have witnessed the destruction of their environment, places such as their favorite restaurant / ice cream shop and other places they frequent no longer in existence. They witnessed seeing their family members, friends and community disappear violently. Then, they are forced to escape through enemy territory (both by neighboring countries and mother nature) where they are often avoid death within a day, hour, or minutes. Their arrival into a foreign country that they know so little about, and being forced to start all over again. There is a lot to unpack for many of our refugees (both past and current), but if our society holds itself to be compassionate, then we must create those spaces for them to safely unpack, heal, and be able to once again, contribute their gifts and ambitions to society. I was a very fortunate one. I was born in the US several years after my parents arrived. I never saw the trauma that they witnessed, but I certainly saw their struggles from the past resurface time and time again. The pressures from integrating into this new society became an everyday burden for my parents and my family members. The pressure to speak a new language, learn new customs, provide stable income despite the lack of sufficient training and upward mobility, and very few spaces and education that provide healing and counseling tailored to their needs only extends the refugee trauma for an even longer period of time. When I first learned of intergenerational trauma, I thought to myself, why am I even connecting myself to my parents’ narratives when I was never a first-hand witness to the Vietnam War or the Khmer Rouge? As I began to uncover the roots of my father’s mental health struggles, I recalled how much my father’s personal trauma had an effect on myself and my brothers. His unpredictable mood swings, his obsession with our academic success, his paranoia and controlling nature over his family led to the downfall of our family’s relationship with him. In return, I experienced my own bouts with low self-esteem, temperamental issues, and distrust with people. However, through these struggles, I have also found community, creative outlets through writing, volunteering, and public storytelling, and confiding in folks who made it safe for me to unpack my own trauma. There’s also the kind of resiliency that I have discovered, that in some ways, I inherited from my parents. How else could they have mustered enough will to survive when they were moments away from facing death, several times over, on their way to safe territory. When I was approached to be a part of a story for Newsy on genocidal trauma, I had some reservations. I was feeling jaded with the Chicago Reader when they mishandled the story about the Cambodian Museum last year. I was also wondering whether or not my mom would feel comfortable enough speaking about her trauma publicly for the first time, or whether my brothers would be okay with me telling our family story. Certainly, my dad, who I have been estranged from the last several years, would not take part in the story, but I also wondered if I was wrong for doing this story without his consent. I developed a great rapport with Melissa Prax, the reporter for Newsy, as she was attentive, sensitive, and took great lengths to make sure that my mom and I was okay through the process. As with the life of journalism, there are always going to be things that are left on the cutting board. My mom spoke about their escape from Vietnam, and how her father (my grandfather) had served in the South Vietnamese army along with her son-in-law in both high-ranking positions. It was until the North Vietnamese took over that they would confiscate my family’s property, placed them under arrest, and closely monitored. Their fears of the North Vietnamese government led to their overnight escape by boat that led them to Malaysia in 1978. My mom spoke at lengths about how traumatic their escape was, but also the hardship they experienced when they arrived to the US. She spoke about how scared they were when they flew on an airplane for the very first time. She recalled how they expressed “shock” when they saw that all the trees were “dead” but come to realize that they came in during winter, and would see them come alive in Spring. She spoke about how her family was put to work after 3 days of arriving, and having to rely on their hosts from the church that sponsored them to run errands, take English classes, and to be more self-sufficient like going to the bank, driving a car, etc. For my grandfather, she said, it was the hardest for him. He often broke down, and felt defeated at times. 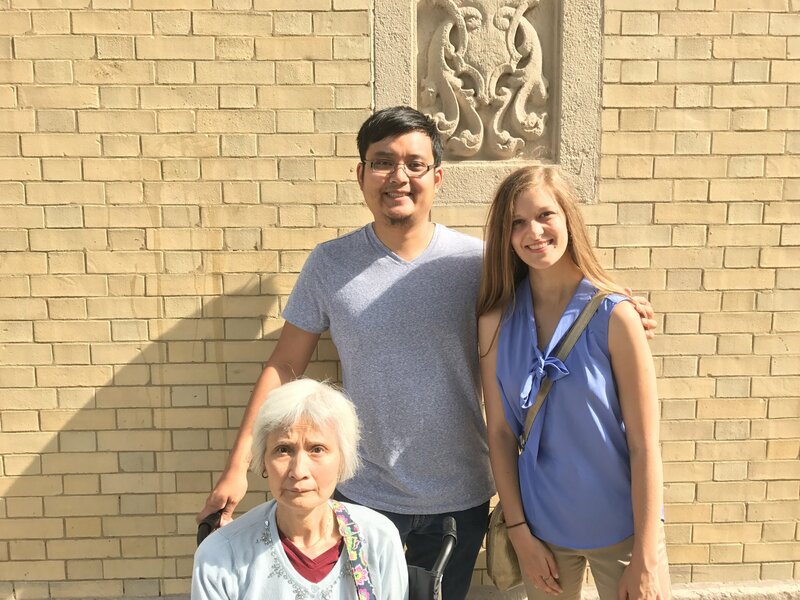 His life up to that point, was being fiercely independent, and navigate his own way to raise his family, but instead, he had to rely on his children, strangers, and fellow Vietnamese friends to get by. He was unable to learn English, and struggled having to work under somebody else. Through this sit-down interview process, I knew what I wanted to discuss. I was no longer afraid of my past. It was time to bring these stories to light. I wanted the stories of our aging Cambodian genocide and Vietnam War survivors to know that they still matter. I wanted folks to know that as we are going through another refugee crisis, I was one of many that existed and have contributed to society because my family were able to come into the US when there was nowhere else for them to go. I also recognize that there will sadly be more genocides in the future, but that we must never forget our compassion when refugees are in dire need of a hand, and to help them to rebuild their lives when they are in safe ground.